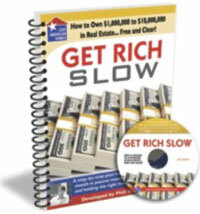 In “Get Rich Slow,” you’ll learn how to make $10 Million Dollars in 10 Years… or to put it another way, $20,000 a month each and every month for the rest of your life. This program contains step-by-step plans for you to build a “Real Estate Portfolio” over the long term that generates $20,000 a month in passive income for the rest of your life. That’s money on complete auto-pilot, that flows into your bank account like the Colorado River flows through the Grand Canyon. Learn what I did right (and what I learned the hard way) so you make the RIGHT decisions the FIRST time. In 10 years, you will measure your financial success by how you implement this Training Program more than anything else you do.